Three days ago it was rhubarb. But today it’s bananas on the Daily Express front page, claiming that the nation’s most popular fruit can cure… well, almost everything. Only on Tuesday was the Daily Express front page telling its readers that rhubarb could cure cancer. But on closer inspection, the story soon crumbled. An ingredient in rhubarb, parietin, could destroy cancer cells in a dish, but there was no evidence that it could work on humans. There wasn’t any proof in the pudding, and the Express ended up with custard on its face (or rather on its front page). What the Express didn’t say is that there’s more chance of a banana stopping a runny nose by sticking one up each nostril than actually eating one. 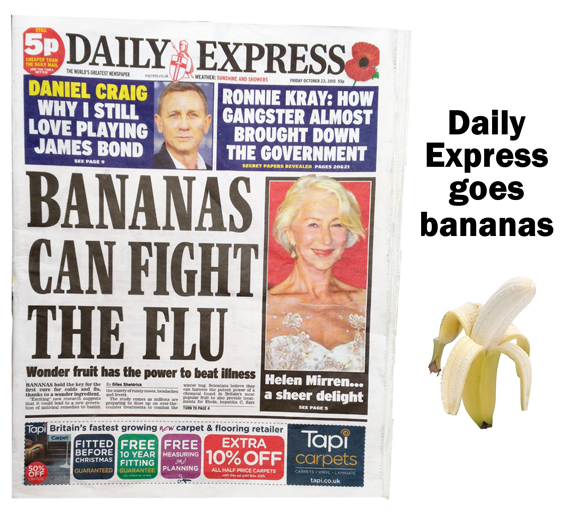 It’s also surprising that the Express only mentioned on its front page that bananas can beat flu. Later, on page four in the story, the Express also claims that the “wonder ingredient” in bananas – called lectin – can also treat some of the world’s most serious illnesses, such as Ebola, hepatitis C, Sars and HIV. But just like the Express rhubarb-curing-cancer-story, there is no evidence yet that the “wonder ingredient” in bananas can cure any illnesses in humans, or that it can be successfully turned into a safe drug. And just like the Express rhubarb story (and, actually, most other Express stories), the truth is nestled in the back-end of the story rather than on the front page. At the end of the story, the Express quoted Professor Barclay, a flu expert, as saying of the potential new treatment, “Let’s hope it can go further”. It’s actually a big hope. New drugs typically take over ten years to test whether they’re safe and really work, and only 1-in-5000 new drugs ever make it to the market place. (And the “wonder ingredient” in bananas hasn’t even been made into a new drug yet). The summer is over, but maybe the Daily Express thinks that every season is the ‘silly season’. Or maybe they just think that all their readers are silly. Or maybe that all their readers are bananas. * Other newspapers have run the banana story today, but not as their front page lead stories. *According to the Urban Dictionary ‘to go bananas’ means 'you behave in a slightly crazy or silly fashion'.